A band comprising vibes/glockenspiel (Pascal Schumacher), piano (Franz von Chossy), bass (Christophe Devisscher) and drums (Jens Düppe) might sound a somewhat precious, rarefied affair, its two main instruments too similar in tone and timbre to facilitate the production of rich and varied music, but Schumacher's quartet, while frequently taking advantage of its unusual instrumentation to explore the hinterland between minimalism and jazz, also packs a surprising punch in its more uninhibited moments. Admirers of Philip Glass and John Adams, whose music relies for its often hypnotic effect on subtle rhythmic and textural changes, will undoubtedly find much to enjoy in Schumacher's 'Water Like Stone', 'Seven Fountains' and 'Taubenturm' (the last two compositions subtly illuminated by fluent but delightfully teasing piano solos from von Chossy), but both in the climaxes of some of these pieces and in the album's more overtly jazz-based material, the quartet hardens into a vigorously interactive outfit, Düppe's brisk, supple drumming driving the band with fierce but carefully controlled energy, the band's sound moving uncontrivedly from tinkling lyricism and a stateliness more often encountered in baroque music to vibrant power. 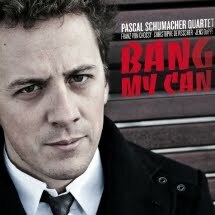 Culminating in the haunting, self-explanatory 'Ghosttrackmusic', Bang My Can is original, intriguing and enjoyable in equal measures. Manchester and Brecon Jazz Festivals. Readers of French and/or insomniacs should try this lengthy review.